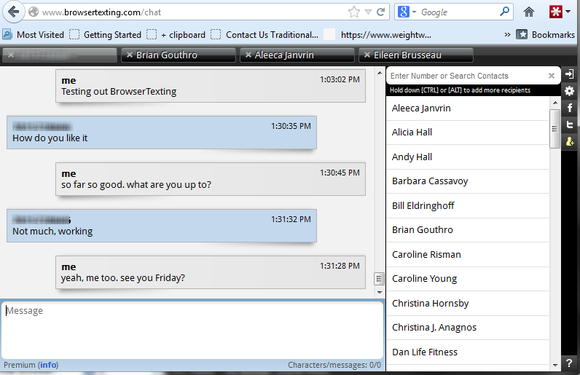 Texting from a desktop browser is a sight easier than from a phone. Android phone owners have several options, such as MobiTexter and MightyText. BrowserTexting ($10, 30-day free trial) is a two-part solution that includes an app that you install on your phone and a Web app that you use on your computer. You first need to install the app on your Android phone, which is a quick and simple process. You then fire up your computer's browser and head to BrowserTexting.com. The setup process here was also simple and streamlined: The website displays QR code that you scan to connect your phone to your browser. BrowserTexting's bland interface isn't the worst of its sins. That would be charging $10 for what free services do just as well. Then you're good to go. 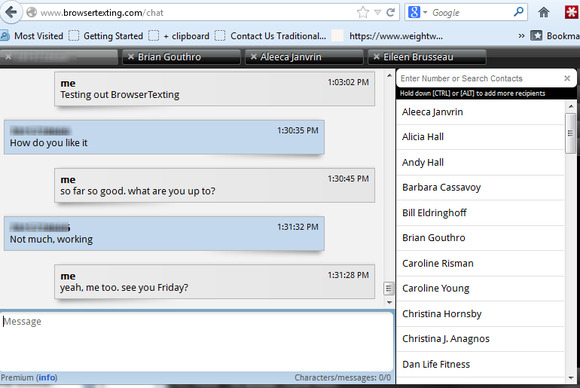 BrowserTexting automatically displays a list of your contacts. You can select one from the list or enter a number on the screen to begin texting. Once you start the message, BrowserTexting brings up past conversations with that person right on the screen, so you can view your texting history as a conversation, just as you would on your phone. You can send MMS messages and group texts, too. New messages pop up on your computer screen, and all of your correspondence is synced back to your phone. 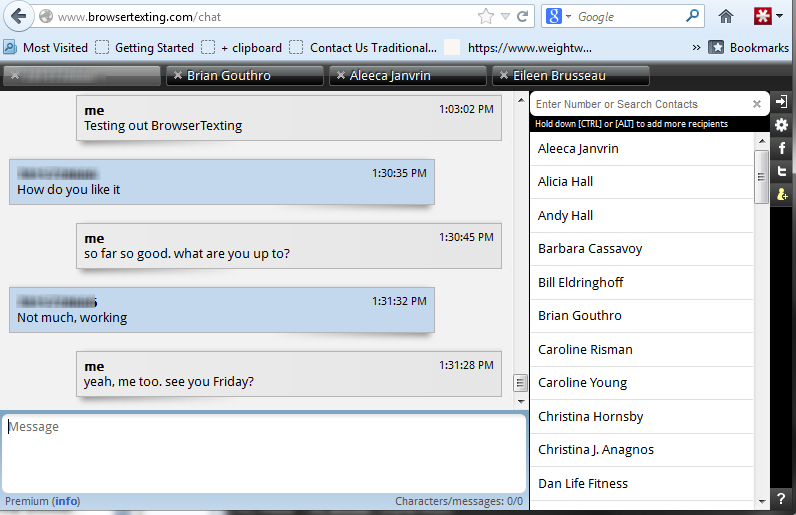 The interface is bland, featuring little more than a big blank space for messages, but easy enough to understand. I like that BrowserTexting offers extensions for Firefox and Google Chrome, which allow you to read and compose messages without opening a dedicated browser window or tab. And I like that it opens new text message conversations in tabs, making it easy to switch between them. I did notice a slight delay when clicking around the interface, whether I was entering a contact name or number or trying to compose a message. That's a minor annoyance, though. More troublesome is BrowserTexting's price: at $10 (after a 30-day free trial), this application is expensive. When most of the competitors are free, an application that costs $10 has to offer far more features. And this one doesn't. BrowserTexting is just as good as some of its rivals, but it costs far more. Note: The Download button takes you to the vendor's site, where you can download the Android app and use the latest version of this Web-based software. BrowserTexting has the basics covered, but it's expensive.